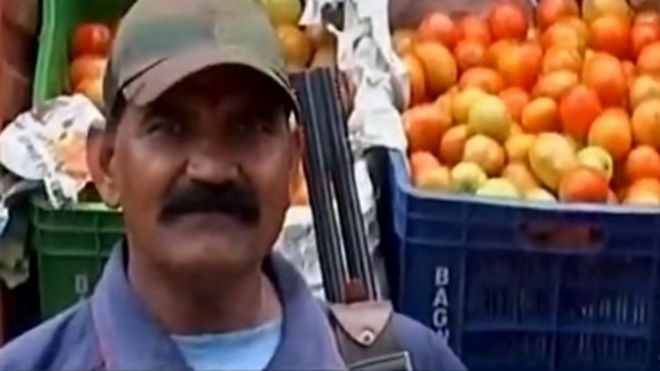 The price of tomatoes has risen so much in India that armed guards have been deployed to protect shipments of them in one state. The Hindustan Times on Sunday cited a wholesaler at a market in the city of Indore, in Madhya Pradesh state, saying that the security of tomatoes was of “considerable concern” because of their “skyrocketing” prices. The wholesaler said the administrators of the Devi Ahilya Bai Holker market had appointed half a dozen armed guards to keep the tomatoes safe – particularly when they are being unloaded from trucks. There have been reports elsewhere in the country this month of thieves making off with tonnes of tomatoes worth thousands of rupees. … doesn’t make it an heirloom tomato; it might still be a tasteless, papery, dry, hothouse-like tomato, with no flavour whatsoever.